How to reach Hotel Continental Terme from Ischia Port. car (or minibus) from Ischia Port to the Hotel. The cost of the service is € 85 for a single one-way transfer and € 55 per person for a one-way transfer of two or more persons. In the following, travel information are reported to reach autonomously the Venue. Napoli Downtown is reachable by train stopping at “Napoli Mergellina” railway station or “Napoli Centrale” railway station or “Napoli Piazza Garibaldi” railway station (at subway level under “Napoli Centrale” railway station) [see Map of Naples]. “Napoli Mergellina” is close to “Napoli Mergellina” Port (500 m. on feet). From “Napoli Mergellina” Port it is possible to take hydrofoils to Ischia Port with the schedule reported in the section “3. How to reach Ischia from Naples” [see Map of Naples]. From “Napoli centrale/Piazza Garibaldi” stations one must reach “Molo Beverello” for hydrofoils and “Molo Pisacane-Porta di Massa” for ferryboats. To reach “Molo Beverello” it is recommended to take either a taxi (€ 9,50) or R2 bus line (bus stop in “Piazza Garibaldi” on the opposite side of railway station). To reach “Molo Pisacane-Porta di Massa” it is recommended to take either a taxi (€ 9,50) or R2 bus until “Molo Beverello” and taking then the shuttle from “Molo Beverello” to “Molo Pisacane-Porta di Massa” [see Map of Naples]. The timetables of hydrofoils and ferryboats are reported in the section “3. How to reach Ischia from Naples”. From Napoli Capodichino Airport “Molo Beverello” is reachable by taxi (€ 16) or by bus (ALIBUS line, (€ 3) to “Piazza Municipio – Molo Beverello”. To reach “Molo Pisacane-Porta di Massa” it is recommended to take either a taxi (€ 16) or ALIBUS line until “Molo Beverello” and then the shuttle (free of charge) from “Molo Beverello” to “Molo Pisacane-Porta di Massa” [see Map of Naples]. Street indications useful to reach Napoli and “Molo Pisacane-Porta di Massa” will be available as soon as possible on the Conference web site. by ferryboat (60-90 minutes) from from “Molo Pisacane-Porta di Massa”. The price of a one-way hydrofoil ticket is about 17 €, while the price of a one-way ferryboat ticket is about 9 € (the prices can slightly vary depending on the company). Hydrofoil and ferryboat timetables are reported here with the indication of the corresponding company. 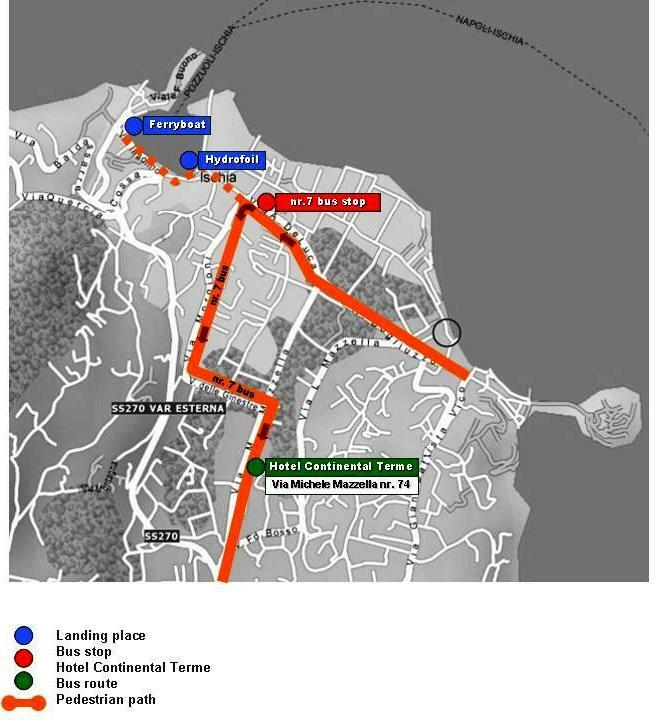 Hotel Continental Terme is reachable from Ischia Port by taxi (about € 10-15) or by bus (line 7,5, CD) from a bus stop whose distance from hydrofoil stop is 300 m. and from ferryboats stop is 600 m.